The NASA/ESA Hubble Space Telescope snapped this view of the heart of the galaxy M82. 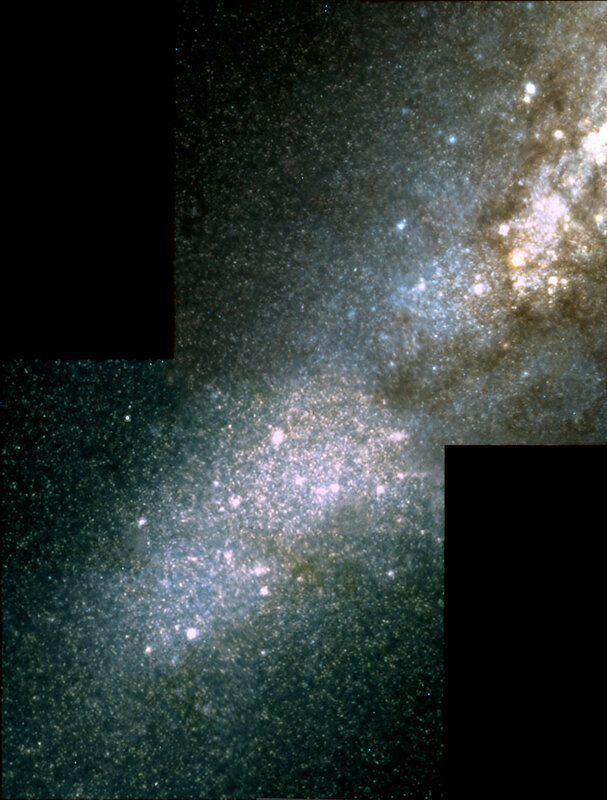 The image was taken in infrared light with the telescope's Near Infrared Camera and Multi-Object Spectrometer (NICMOS). Hubble peered through thick dust lanes to find some of the galaxy's more than 100 super star clusters. The clusters are the larger white dots scattered throughout the picture. They were formed during a violent encounter with the galaxy M81 about 600 million years ago. The thousands of stars in the galactic background belong to a population of red giant stars in M82. The galaxy is 12 million light-years from Earth in the constellation Ursa Major. The pictures were taken on September 15, 1997. Two images each composed of eight exposures were combined for the NICMOS mosaic: 768 seconds in J (1.1 micron - here coloured blue) and 768 seconds in H (1.6 micron - here coloured red) in total. Green is constructed from a mix of J and H. This image is issued jointly by NASA and ESA. Position (Dec): 69° 41' 9.98"